The Carolina Inn is my favorite place to stay in Chapel Hill, NC. This beautiful historical hotel combines classic Southern charm with modern day luxury. Nestled inside its corridors is the prestigious Carolina Crossroads offering a fine dining culinary experience. The combination makes the Carolina Inn the perfect place for an incredible weekend getaway. The Carolina Inn invited me to stay and enjoy an evening of fine dining at the Crossroads Chapel Hill in exchange for an honest review. All opinions are of my own. My husband is a HUGE UNC fan, so much so, our daughter is named Caroline. Anytime he has an opportunity, he tries to go to UNC’s basketball or football games. We live an hour and half away, therefore sometimes a day trip turns into an overnight stay. If we are lucky (the rooms get booked full very quickly) we try to stay at The Carolina Inn. 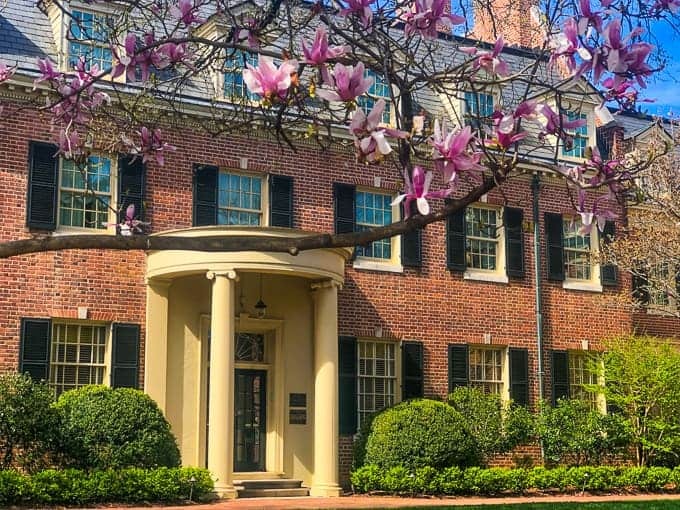 Built in 1923 in a Colonial Revival Style, this beautiful historical Inn sits elegantly in the heart of Chapel Hill. The hustle and bustle of Franklin Street for shopping, dining, and entertainment is just minutes away by feet. The interior lobby is broken into stylishly decorated open gathering rooms. These rooms are filled with antique wood furnishing intwined with UNC accents. Several sparkling chandeliers dangle elegantly from the ceilings. The sitting rooms are an inviting atmosphere for sipping a cup of coffee or hot tea. A workout room available with weight-lifting and cardio equipment. A free shuttle service to local destinations and free Wi-Fi throughout is provided. Its spacious grounds and elegant meeting rooms make the Carolina Inn a perfect venue for parties and weddings. 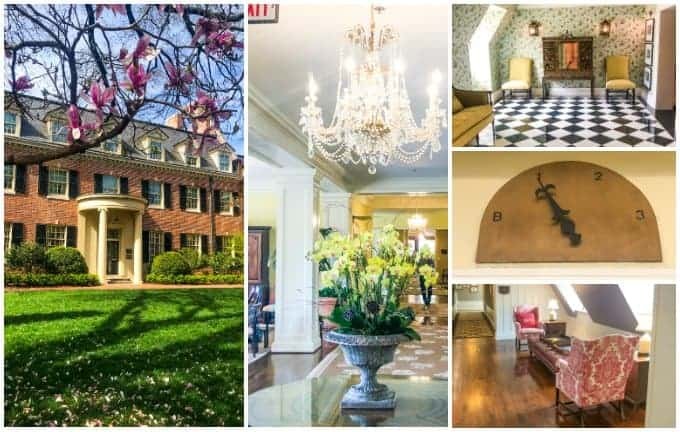 What are the rooms like at the Carolina Inn? Inspired by Southern Antique furniture, the rooms are handsomely decorated with a four poster bed. The sheets are crisp, the pillows are fluffy, and the plush bed mattress is wonderfully comfortable for sleeping. The bathroom has a white marble topped vanity, lovely basket weaved tile flooring, and a spacious walk-in subway tiled shower. A large flat screen tv offers a wide variety of cable tv channels. There is a small mini fridge, complimentary tea, coffee, and wifi. 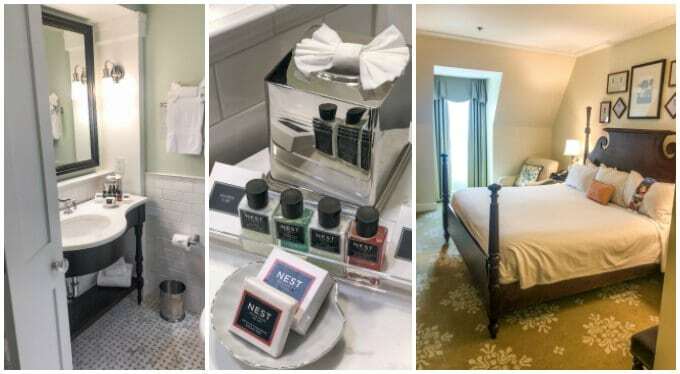 Also included is an assortment of NEST soaps, lotions, shampoo, and body wash. Nightly turndown service is provided. 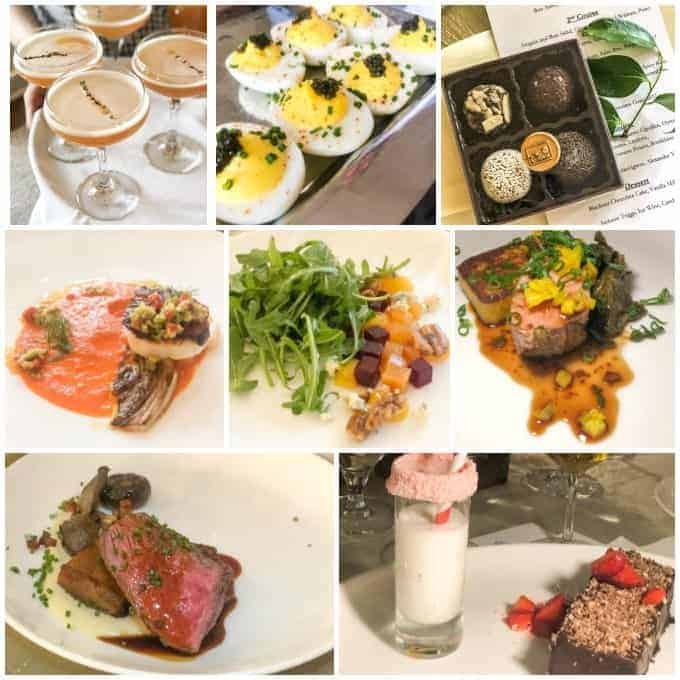 During my stay, I had the opportunity to partake on one of Chef Blankenship’s five course meal paired with signature craft cocktails and wine. The meal was INCREDIBLE. Every dish was artistically plated and gastronomically flavorful. We started with deviled eggs topped with caviar then moved to our first course of seared diver scallops with charred fennel over provencal tomato, topped with piquillo pepper tapenade. The second course was a colorful beet, arugula, and blue cheese salad. The third course was a North Carolina Cheshire pork tenderloin with spicy kale, butternut squash spoon bread, and chow chow. The fourth course was a grilled prime NY strip, balsamic cipollini, oyster mushrooms, lardons, parsnip puree, and lyonnaise potatoes. The meal ended with a lovely blackout chocolate cake and vanilla milkshake. Have I made you hungry yet? Chef Blankenship is brilliant for his ability to maintain the integrity of traditional Southern dishes while transforming them into something more exotic. His attention to fine details and use of quality ingredients really stood out. The diver scallop was sweet. The NC Cheshire pork and Prime NY strip steak were juicy and tender. The sauces, relishes, and tapenade accented the cookery rather than overpowering the star flavors. His sourcing of local ingredients allowed me to feel good about what I was eating. Watch the video below for up-close footage of the incredible dinner. Jeremy Blankenship’s is a wonderfully creative and talented chef. His team worked incredibly hard preparing the plates, serving them hot and fresh, refilling the wine, and bussing the dishes. It was a constant movement of changing on the table top. His team took pride in their hospitality and it made the night even more enjoyable. My dinner at the Crossroads Chapel Hill will now rank as one of my favorite dinner memories. The menu changes seasonally and I can’t wait to go back to see what will be next. I hope you will go and try them out also! Don’t wait for a special occasion, after all there are only seven days a week and someday is not one of them! This sounds so lovely, I am down for some fine dining.